Too Many Choices? It’s Hard To Decide! with decision-making. What to do? … you decide to join an association to network, be part of the community and potentially meet prospective clients. decide which one would be best. narrowed it down to one or two associations, the decision will be easier. Plus, that overwhelmed feeling will go away. way to limit the options? We hope you will give it a try. Everyone procrastinates from time to time — Olympic athletes, billionaires, Charlie Brown and even Professional Organizers. We’ve all heard the horror stories of failure and destruction brought about by procrastination, but how can something that is so natural to the human condition be all bad? Dr. Steele’s definition is a good one, and we agree that procrastination can put a person in a bad spot. However, if everyone procrastinates from time to time, how realistic is it for us to deny it? 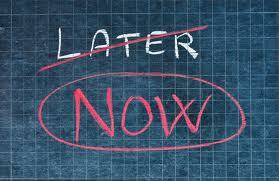 Are we just setting ourselves up for failure and guilt by promising ourself never to procrastinate? In the spirit of “we all do it anyway”, let’s make the best of procrastination. Here are tips to make your procrastination as useful as possible. Name the emotional beast that is causing your procrastination: fear, perfectionism, stress, distractions. Once the beast is named, it can more easily be tamed. Make a list of all the steps involved in completing the large task. How do you eat an elephant? One bite at a time. Schedule appointments with yourself to complete the tasks, and keep those appointments. Update your To-Do list. Free your brain from all the random tasks you are trying to remember and you may find it easier to focus on the task at hand. Step One: Go ahead and procrastinate, just keep a list of all the items you are actively and willfully procrastinating. Step Two: Set aside an entire day to perform all the distasteful, dreaded, or just plain boring tasks on your list. Race against the clock to accomplish the tasks. Strive for completion, not perfection. Step Three: Celebrate at day’s end with the reward of your choice. Are you ready to procrastinate productively now? No? Maybe later then. **Thanks to Real Simple Magazine (April, 2011) for this genius idea. This morning I had a lot of calls to make and did not particularly feel like making them. Then I remembered the book I had just finished reading — Eat That Frog by Brian Tracy. In the book procrastination is not allowed. I would need to make the calls first thing and begin with the most difficult one. Ug. Well, I did it and it felt wonderful. Tracy’s premise is that starting and completing the most important — and often the most difficult — task of the day will soon become a habit. Email and less important to-dos must wait until the most important one is done. 1) What are my highest value activities? 2) What are the biggest frogs I have to eat to make the greatest contribution to my organization? What can I and only I do that, if done well, will make a real difference? 3) Ask yourself every hour: What is the most valuable use of my time right now? What important eat that frog task will you tackle tomorrow morning? We all have too much email. It feels endless. But there is an easy way to reduce email volume: Unsubscribe. As email efficiency experts, we highly recommend unsubscribing to as many emails as possible as long as it is a legitimate site. You can always sign up again at a l ater date. Then why don’t we make the extra effort and unsubscribe? Why do we leave the emails in our inbox? They waste energy and time because we need to flip through them to get to the email we really want and need. 1) I don’t have enough time to scroll to the bottom of the email and click the unsubcribe link. 3) It’s not worth bothering. The next time you receive an email you do not need, take the 1-2 minutes to unsubscribe. Do it immediately. Think of it as eliminating not just that current email but future unwanted emails that will automatically show up in your inbox every day or week or month. 1) Create a folder called “Unsubscribe” and drag the emails from which you need to unsubscribe to that folder; Set up a 1/2 hour every week to unsubscribe. What a great feeling to reduce the email in your inbox! 2) Unsubscribe to one email each day. 3) Make it a game. Set aside 10 minutes daily and challenge yourself to see how many emails you can eliminate by unsubscribing. A timer is an excellent tool for this activity. Are you inundated with email? Call Leslie or Barbara at 404.303.8431 or email: Info@ItsTimeToGetOrganized.com. We can help reduce your email volume and your stress. It’s Memorial Day weekend and many of us have made plans for relaxation away from the office. Can you switch off your your smart phone, Ipad, and laptop? Or are they going too? Study after study shows that we return to work energized after a clean break from technology and the day-to-day routine. Not being encumbered with work-related problems leaves our mind free to enjoy new experiences and the people around us. 1) Tackle projects that need attending to weeks in advance. This is definitely not the time to procrastinate. 2) Allow plenty of time just before you leave to finish tasks that are on your mind. 3) Cancel or reschedule meetings and appointments. That alone will help put your mind at ease. 4) Leave time for “re-entry” into the business world when you return from your getaway. Put off appointments and meetings for a day or so until you have had a chance to get your bearings. Now are you ready to leave your technology aids behind and bring back wonderful memories that will make you smile every time you remember them? Need help getting organized before you leave for vacation? Email Leslie and Barbara at: nfo@ItsTimeToGetOrganized.com or call 404-250-9600 to speak to us directly. How many times have you intended to do something very important but you just cannot get to it? Other, less important tasks get in your way. Before you know it, the time is gone and you haven’t completed a critical task. STOP and EVALUATE the situation. Often by thinking it out before actually doing the less important task, you will be able to weigh the advantages of both tasks and decide what to do instead of acting impulsively. Decide WHEN to do both tasks and put the time on your calendar. If you choose the less important one now, then set another time to tackle the critical project. FOLLOW THROUGH on the appointment to complete the important project. If you continue to rocrastinate, ask yourself why and what you can do to complete it. Often times writing it down on a piece of paper is a big help, especially if you are a visual learner. ASK A FRIEND for help – to shadow you, work alongside of you, or to serve as an accountability partner. The next time you have to choose between two tasks – one urgent and one important – try one of these tips. Need time management help? Call Leslie or Barbara at It’s Time To Get Organized (404-250-9600) or email: info@ItsTimeToGetOrganized.com. We can help you get those important tasks done on a timely basis so you accomplish your goals.